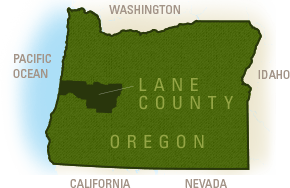 At the crossroads of Willamette Valley&apos;s beloved Territorial Highway and Highway 126 to the Oregon Coast, is the country town of Veneta. A natural stopping place on any excursion, Veneta offers several restaurants, stores and even an electric vehicle charging station. But a quick pit stop doesn&apos;t reveal Veneta&apos;s real beauty - that requires settling in and lingering at a wildlife watching wayside, on the water off Perkins Peninsula or at a boutique winery with Oregon&apos;s best Pinot swirling in your glass. Watch the mist rise from the marshes, a Great Blue Heron take flight or the sunset tint sailboats red, orange and purple as they scurry across the rippling reservoir. Pitch a tent or pull up your RV into a waterfront site at Fern Ridge Reservoir, or book a brightly colored yurt right in town. Stay in a bed and breakfast or roll up your sleeves at a farm stay gig. 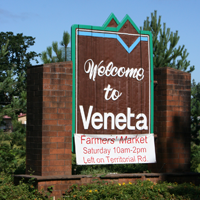 Veneta offers many unique opportunities for connecting with the rural ambiance of the Willamette Valley. Veneta's marshes, fields and woodlands are a natural habitat attracting a thriving bird population. The Territorial Wine Trail's midpoint runs right through downtown Veneta. 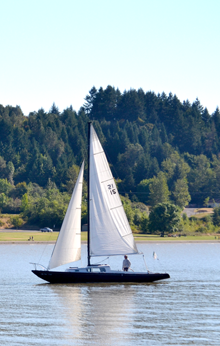 From regattas to shoreline picnics, the reservoir is an inviting recreational destination. This annual event draws thousands to its magical playground.